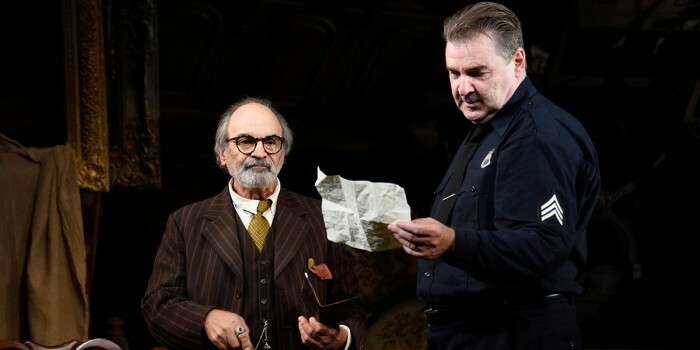 David Suchet and Brendan Coyle will reprise their starring roles as Theatre Royal Bath’s production of Arthur Miller’s The Price transfers to the West End in February. Marking the 50th anniversary of the riveting drama’s debut, The Price played a critically acclaimed run in Bath earlier this summer. It will now play at Wyndham’s Theatre from 5 February 2019 until 27 April. The legendary Suchet (well known for playing Poirot) will portray furniture dealer Gregory Solomon, and Olivier Award winner Coyle (John Bates in Downton Abbey) will play cop Victor Franz, in Miller’s familial drama, which sees two brothers uncover the heart-breaking price of decisions made decades earlier. Adrian Lukis (Collateral, BBC) and Sara Stewart (Fresh Meat, Channel 4) will also reprise their Theatre Royal Bath roles – William Franz and Esther Franz respectively – in the West End transfer. Jonathan Church directs. The Price was first seen on Broadway in 1968, going on to receive two Tony Award nominations including Best Play. The show follows Victor and Walter Franz – two brothers who meet for the first time in sixteen years to sell their family furniture, but in the process uncover a series of shocking revelations. In the middle of this psychological battlefield is the wily appraiser Gregory Solomon, who has his own demons to conquer in securing the best possible price. The play was also recently revived in New York in 2017 starring Mark Ruffalo and Danny DeVito. A richly affecting tale, The Price explores the perils of the American Dream. The Price has design by Simon Higlett, lighting design by Paul Pyant, sound design by Mike Walker, composition by Matthew Scott, associate direction by Emma Butler and casting by Gabrielle Dawes CDG.